Lafayette’s mock trial team took first place at the Philadelphia Regional Tournament hosted this month by Villanova University. 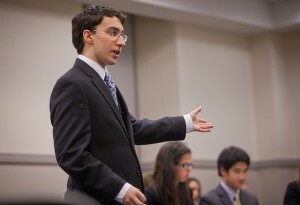 Ryan Kraus ’15 (Stamford, Conn.) received an outstanding attorney award with the highest point total of any participant. The team advances to the American Mock Trial Association (AMTA) Opening Round Championship series March 14-15 in Washington, D.C. The top 48 teams from the opening round will move on to the AMTA National Championship Tournament April 17-19 at University of Cincinnati. Nineteen schools competed at the regional tournament including Drexel, Fordham, Franklin and Marshall, George Washington University, Johns Hopkins, Temple, Penn, and University of Virginia. More than 500 teams participate at one of the 25 regional tournaments across the nation. Throughout the competition, students act as witnesses and attorneys to argue the fictitious civil case, Andy and Lee Park v. Hayden Duran. Teams choose to pursue either the claim of intentional shooting or parental negligence in a case involving the death of an 11-year-old girl, Sydney Park. Each team prepares the same case, but must come up with its own theories and strategies throughout the season. Other students who will compete in Washington, D.C., are Samantha Berg ’18, Brian Brundage ’18, Nicholas Contarino ’18, Shannon Costa ’18, Aaron Freedman ’15, Lauren Laurenceau ’18, Kaitlyn Lutz ’18, Brianna Messina ’17, and Phoebe Silos ’18. Congratulations to my grandson Ryan Kraus! I am so proud of you and all of your achievements over the years. Good luck to you and your team mates in the next round. Congrats to the team and good luck with the series in Washington, DC!